Gwion Edwards (on floor) opens the scoring for Posh at Shrewsbury. Photo: Joe Dent/theposh.com. Peterborough United manager Grant McCann remained upbeat despite a fifth League One game without a win tonight (September 27). Posh dominated the first-half at Shrewsbury, but crucially scored just once when midfielder Gwion Edwards headed his fifth goal of the season. Posh star Marcus Maddison chases the ball alongside Shrewsbury's Junior Brown. Photo: Joe Dent/theposh.com. But it all turned sour after the break as the home side equalised against the run of play and within minutes Posh centre-back Ryan Tafazolli was sent off after conceding a penalty. Fortunately for Posh on-loan goalkeeper Luke McGee saved the spot-kick, much to McCann’s relief. McCann said: “It was a very good away display. We started the game better than of late and carved them open regularly in the first-half. “And after the sending-off we showed plenty of resolve to make sure we left with a point. We came to win, but we’ll take the point having played most of the second-half with 10 men. “If Ryan doesn’t get sent off we win the game. There’s no doubt about that. I’ll have to look at it the red card decision again before we decide whether or not to appeal as I thought ‘double jeopardy’ was supposed to apply this season. The referee told me Ryan was sent off because he didn’t slide to make the tackle. I’m no referee, but I’m not sure that’s right. 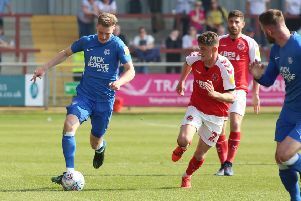 “It’s frustrating not to have won again, but I was encouraged by the football we played in the first-half and encouraged by the way the likes of Marcus Maddison and Gwion Edwards dug in after we had a man sent off. “We just needed that second goal, Marcus has hit the post right on half-time which would have been a game-clincher and their goalkeeper made a couple of great saves. “But the boys summed it up well for me. They came in at half-time and said they should have been four or five up. Tafazolli will be suspended from the Southend trip unless Posh launch a successful appeal against the red card. Posh actually moved up a place to ninth in the League One table tonight.